When you really want to have it all- beaches, outdoor activities, a close-knit community, and top-level schools- then Kailua is the place for you. 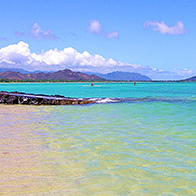 Located on the Windward side of Oahu, Kailua is easily accessible by three different freeways that traverse the Koolau Mountain range, making it both a cozy and secluded beach community, while remaining convenient to the Downtown Business District and many of Oahu's schools and Universities. Kailua is best known for it's incredible stretch of long sandy beach, where homes come at a high premium, and none other than the First Family comes to spend their Christmas Holiday's. While Kailua has grown from a little known beach town to a hot spot for high-end investors and travelers looking to get off the beaten path, it still retains a true sense of community. Locally owned stores often out-perform national brands in the shopping district, and parades, local craft fairs, and school fundraisers are frequent weekend activities throughout the year. Kailua is also home to the 3-mile Lanikai loop, an exclusive beach enclave at the end of Kailua, featuring its own stretch of beach, and the picturesque Mokulua Islands. Lanikai is the perfect merging of casual beach community and luxury island lifestyle, making it a haven for celebrities as well as discrete local entrepreneurs and kamaaina families. Kailua also boasts a number of top-rated public and private schools, including Lanikai Elementary Public Charter School, Aikahi Elementary, Le Jardin Academy, Redemption Academy, Kailua High School, and Kalaheo High School. For more information on Kailua and Lanikai Real Estate, contact our Kailua Specialist or call us at 808.971.7711.